The weather here in southern Indiana has been simply beautiful for the past week. Temps in the high 70's-low 80's with low humidity. I've often said I'd love it if our summer's would be like this. Unfortunately, I know that we'll be in for hot, humid, unbreathable days in the near future. This evening I was out driving and taking photos when I stopped and placed an order for fresh blueberries to pick up tomorrow. They were picked out today. Yeah, I'm not picking this year. Anyway, on the drive back, I passed this roadside marker and found myself wondering once again why anyone would want to mark where a love one died. 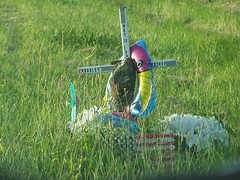 I'm not sure why, but I've always thought these memorials more than a bit bizarre or macabre. I don't think I would need a cross draped with flower and other sorts of trinkets to remind me where someone I loved died. I think that goes without reason. So, why mark the spot? Because they want someone to possibly know something very bad and tragic happened here. Maybe if it's on a roadside, they want others to watch out or be careful - that it can be a dangerous road. Sometimes people just need the feel to reach out, even if they'll never hear the comments. Isn't that what it's like posting a blog? Bloggers often have no clue if anyone is reading their stuff, yet still do it anyway. A lot of public things are done for yourself. Thanks for commenting, anon. You could be right about public things being done for oneself. Almost a bit selfishly perhaps?